While I don't have quite as much of the "toasty" internal problem as you do, I can at least empathize. I also much prefer cool to warm, and I LOATHE hot. (You can add all the layers you want, but you can only take so much off!!) Where I work, either maintenance or the management has decided that the heat needs to be on all the time, even though it's only in the 40's or 50's outside (we don't get snow here, BTW), and there is SUN. So in my office, which has windows, it is now between 75 and 78 degrees every day, and I have NO control over it. If I wear sweaters, I roast! 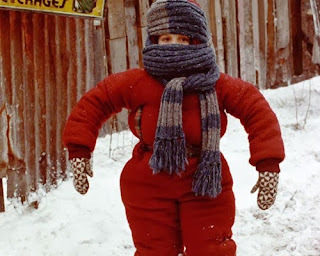 But my van's heater has been broken for years, so I have to bundle up going to and from work or I freeze. Can you bring fans to work for your work space, or borrow some from them? That might help at least a little. I have two fans, and they do help. One is on the floor, tilted upward so it blows up my skirt when I'm standing. :D Ha ha! Refreshing! I know what you mean! My old uni was over airconditioned in summer, so much that I had to wear tights in, and bring a jumper! Then in winter it was an Inferno! I had to go with bare legs and remove layers down to a shirt!!! Ridiculous! And not good for your body!!! I always used to be cold, now I get too hot a lot and I miss being cold so much! It is much easier to layer up! I will never understand why buildings are overcooled and overheated. What a huge waste of resources and money! I'd much rather run cold. I love layered looks, but I can never wear them. People have a funny definition of "freezing." I have the same problem as you, I am ALWAYS the one who is too hot in any room and people look at me like I'm nuts! It drives me insane how hot people keep indoor spaces as I hate summer clothing! I like scarves and tights and boots! Turn down the heat! I read this and nodded in complete understanding - I'm also someone who 'runs hot'. Perhaps we are lycanthropes?! It's nice and cold where I live by the sea. I think I'd melt into a puddle anywhere hot! People in office buildings should be grouped by temperature. It would be so much simpler! That sounds really difficult. I have the opposite problem of often being cooler and feeling cold even on warn days. Let's combine forces and both be comfortable! ;) Ha ha!